A few visitors have asked me to list some common tree scale sizes.. While scale tree heights are reasonably simple to calculate, this approach is almost always problematic because the trees just don’t look right! especially when modelling the smaller scale, such as N.
N-scale, scale trees seem way too small tend to look more like tall bushes than trees! Many modelers work on the precept that a mature-tree height averages about 15m (50 ft), whith some trees being taller, and most shorter..and always remembering that it is very rare for trees to all be the same height at once! (trees grow at different rates and are always being replaced with new saplings and dying-off as their ‘use-by date’ is reached, while local climate and soil conditions also influence growth rates and even size). 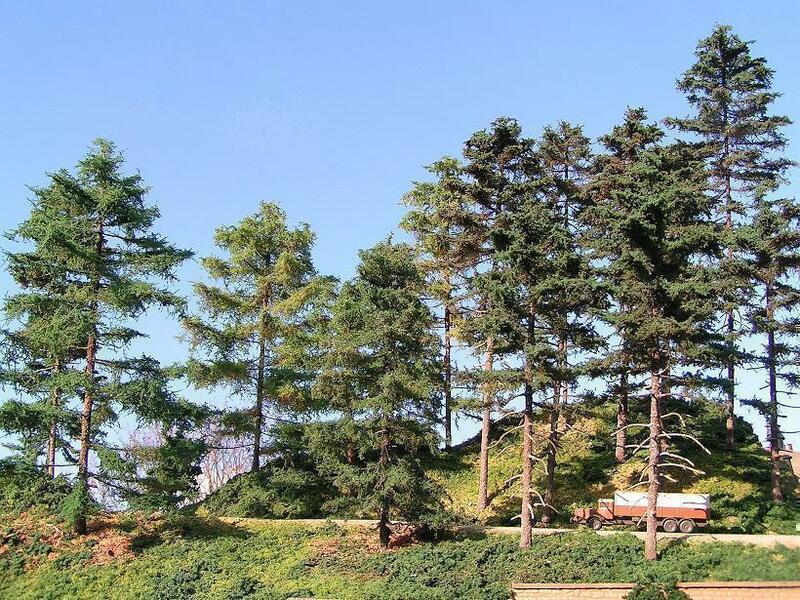 Keep in mind when constructing scenery and trees, that trees tend to be bigger and taller than the trains you will be running, so having trees that are out-of-scale may actually help to create the correct look and feel, and may even make your trains part of the landscape, rather than dominating it.